I had a little MODA-vation this weekend to sew some more hexagons...a project I had started a while ago. I think this was our last weekend of college tours, so we drove to Massachusetts and then to New Hampshire. I always bring some kind of hand sewing in the car. I have all these 4 1/2" and 5" squares from several different Moda lines...Mistletoe Manor for one, but can't recall the others. 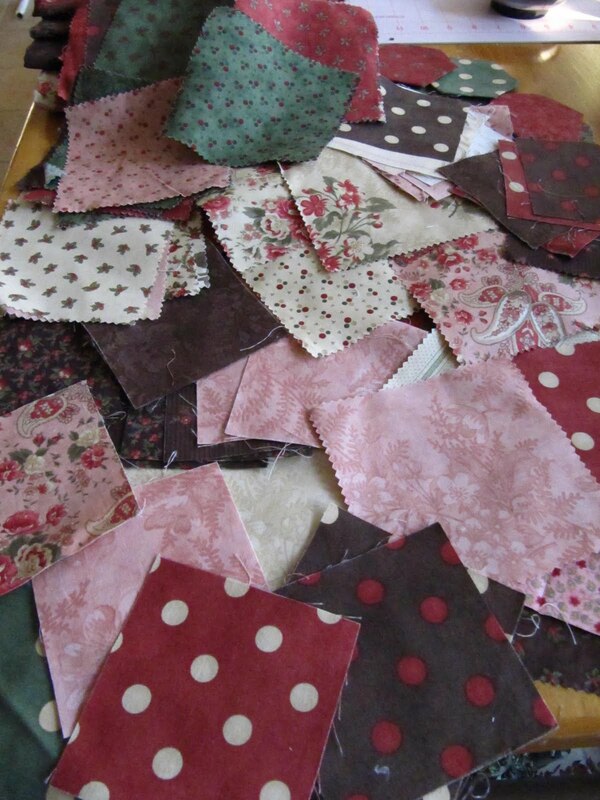 Then I have some yardage to cut up too. This is the bunch I sewed in the car. I made this project using a bigger hexagon, so when I start sewing them together, it will finish up faster!!! 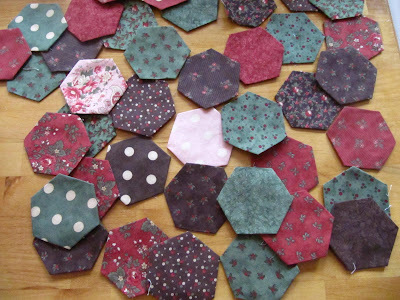 Unlike this project of smaller hexies, which I will be sewing for the rest of my life. If you are new to hexagons or Grandmother's Flower Garden, I have a tutorial for English Paper Piecing here. (I really need to redo that tutorial...that was one of my firsts, only blogging for a few weeks last February 2009.) Such a newbie! a lot of people seem to be working on these little hexie's I did one years ago before I knew what I was doing and it is not very neat - I might have to do another in the future. Nice day for a drive! I thought I heard someone yelling a friendly hello out the window as they drove by my town...must have been you! So did you go to everyone's favorite quilt shop in NH, or were you not going that far north? Of course I am referring to Keepsake Quilting! 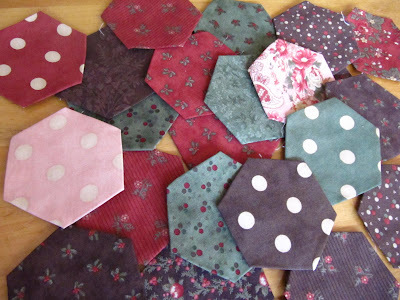 Love all your little hexies...nice fabrics! 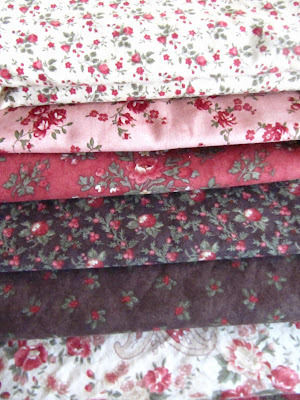 I love the fabrics you have chosen for your hexies, especially the florals. You have the patience of a saint to sew and piece them all by hand! It's going to be beautiful! I am a sucker for anything from 3 Sisters! BTW, the small print with the little roses is from Vienna Nights. I only know because I had a little addiction problem with that fabric line! 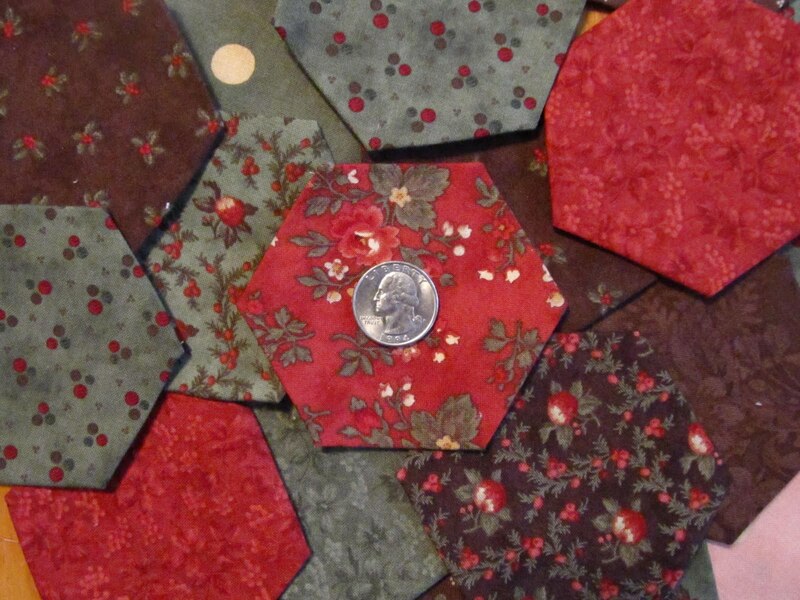 Every time someone posts a hexie project I'm tempted, just over-whelmed by the prospect of CUTTING all that. Maybe, I'll try using up my scraps that way, Hum. Yours will be gorgeous, all your work is! Karen I love your choice of colors. MODA...MODA...MODA....I love me some MODA!!! I'm slow going on my little hexies too! It will make a gorgeous finish! I love hexies. Very impressive that you sew while in a car. It's sort of like reading in a car for me, doesn't always work. I'm eager to see the end result of all these hexies! Oh I love College trips!!! What beautiful fabric, I just love it! Great idea, I wish I coukld sew in the car, but I get car sick!! Everytime I see hexagons, I have to resist because I just know they're addictive. I'll just enjoy your lovely ones. Doing the big hexes is fun - especially after doing small ones.